Is motion analysis a valid tool for assessing laparoscopic skill? The use of simulation for laparoscopic training has led to the development of objective tools for skills assessment. Motion analysis represents one area of focus. This study was designed to assess the evidence for the use of motion analysis as a valid tool for laparoscopic skills assessment. Embase, MEDLINE and PubMed were searched using the following domains: (1) motion analysis, (2) validation and (3) laparoscopy. 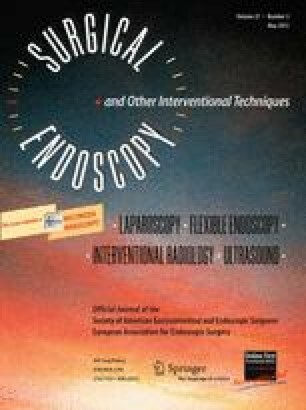 Studies investigating motion analysis as a tool for assessment of laparoscopic skill in general surgery were included. Common endpoints in motion analysis metrics were compared between studies according to a modified form of the Oxford Centre for Evidence-Based Medicine levels of evidence and recommendation. Thirteen studies were included from 2,039 initial papers. Twelve (92.3 %) reported the construct validity of motion analysis across a range of laparoscopic tasks. Of these 12, 5 (41.7 %) evaluated the ProMIS Augmented Reality Simulator, 3 (25 %) the Imperial College Surgical Assessment Device (ICSAD), 2 (16.7 %) the Hiroshima University Endoscopic Surgical Assessment Device (HUESAD), 1 (8.33 %) the Advanced Dundee Endoscopic Psychomotor Tester (ADEPT) and 1 (8.33 %) the Robotic and Video Motion Analysis Software (ROVIMAS). Face validity was reported by 1 (7.7 %) study each for ADEPT and ICSAD. Concurrent validity was reported by 1 (7.7 %) study each for ADEPT, ICSAD and ProMIS. There was no evidence for predictive validity. Evidence exists to validate motion analysis for use in laparoscopic skills assessment. Valid parameters are time taken, path length and number of hand movements. Future work should concentrate on the conversion of motion data into competency-based scores for trainee feedback. J. Ansell is currently funded by a Royal College of Surgeons England research fellowship grant. Authors John D. Mason, James Ansell, Neil Warren and Jared Torkington have no conflicts of interest or financial ties to disclose.